The usual culprits top the list again this year: Rupert Murdoch's Fox, Frank Lowy's Westfield and the host of real estate trusts listed on the Australian Securities Exchange. These are our thoroughbreds of tax avoidance; the nation's chief "leaners", as opposed to its "lifters", the ordinary tax-paying Australians, small businesses and big retailers who fork out their fair share. Those singled out in for special mention in the latest report from the Tax Justice Network will scream blue murder that they obey the law, that they have a duty to their shareholders to minimise tax. This much may be true. The one simple thing about corporate tax though, despite its impenetrable complexity, is that every year in a company's financial statements there is a number showing exactly how much has been paid. Or in the case of Rupert Murdoch's media empire, how much it got back. This group has historically "leaked" very little in tax but last year it even won an $880 million rebate from the Australian Tax Office for a company restructure – where no money changed hands – back in 1989. It has now split into two entities, News Corp and Twenty-First Century Fox. Fox, which led the pack for sheer numbers of tax haven subsidiaries, was also cited for the dubious honour of having the greatest negative impact on Australia's tax base. With its effective tax rate of just one per cent – even before last year's rebate – the Tax Justice Network estimates $1.6 billion in tax forgone. Elsewhere, the word "aggressive" was used a number of times in respect of the tax practices of the world's biggest shopping mall operator Westfield. Toll-road operator Transurban, Sydney Airport and many stapled trust structures spawned from the loins of the Macquarie Group were also among the nation's top leaners. They will argue it is up to their unit-holders, members in the trust that is, to pay income tax not them. Yet many of these are offshore or are trusts themselves which enjoy special tax relief. The two biggest miners, BHP and Rio Tinto, were nominated for failing to disclose all but a fraction of their tax haven subsidiaries. These pay good deal more tax though than the third biggest miner, Glencore, whose coal holding company enjoyed an $8 million rebate last year. The point is that while tax avoidance is rife among companies in the ASX Top 200, which are covered by the analysis, it is far worse among multinational companies who have their headquarters elsewhere. It is a good thing for taxpayers that executive pay schemes are mostly based on profits and share prices. This way, there is an incentive for companies listed on the Australian Securities Exchange to sustain a high share price by delivering high profits, profits which are taxable. Unfortunately, the opposite forces are at play for multinationals that operate here. The higher their costs and the lower their profits the better. They pay less tax in this relatively high-tax jurisdiction and transfer their profits, often by loans from their foreign associates, elsewhere. Still, as highlighted in the latest report by the Tax Justice Network, tax avoidance remains rife among the S&P/ASX 200, although admittedly in a different league to the likes of American tech giants Google and Apple, which pay virtually nothing. The report recommends some things that need to be done to combat tax avoidance, such as tightening up the "thin cap" rules on how much debt a company can run (therefore soaking up profits in interest rate payments a la the REITs, Sydney Airport, Transurban and the power companies). Another no-brainer is phasing out stapled securities (where the heavy debt sits in the company and the distributions come untaxed via the trust). Such structures would be laughed off the bourse by regulators in other countries. They are particularly noxious when deployed by utilities. The likes of DUET, APA, Envestra and SP AusNet (now AusNet Services) already enjoy almost riskless returns from regulators while they run big borrowings to boot. Both taxpayers and customers lose. There is a more obvious quick-fix for tax dodging, however. That is transparency. The idea that Australia has to wait till November to kick off the collegiate process of tax reform at the G20 is a furphy. Measures could literally be adopted tomorrow. For a start, it should be mandatory that all foreign subsidiaries are disclosed in financial statements. The Tax Justice Network study noted that in 2013, "BHP had 462 subsidiaries in 49 countries; tax payments were disclosed in 12 countries, but not in the other 37 countries with 128 subsidiaries. 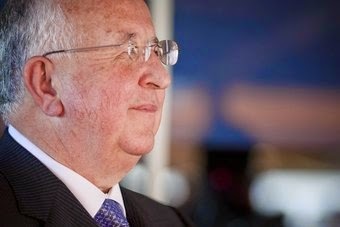 Rio Tinto had 926 subsidiaries in 71 countries; tax payments were disclosed in 28 countries, but not in the other 43 countries with 111 subsidiaries." It was more scathing of Westfield's disclosure. Westfield listed more than 700 subsidiaries and controlled entities registered in nine different jurisdictions in its 2010 accounts. "By contrast, the 2013 Westfield Group annual report listed just 21 subsidiaries and controlled entities. This does not reflect a disbursement of these subsidiaries by Westfield; rather, the company has simply revised what they consider to be 'material' to shareholders. The net result is that the company's operations are much less transparent." The broader challenge here is that the business of the big four accounting firms – Deloitte, Ernst & Young, KPMG and PwC – is assisting large corporations on how best to dodge tax; a lucrative practice. Accountants and lawyers from these firms are routinely on secondment with regulators – the Tax Office and the Australian Securities and Investments Commission. Regulators are to a great extent therefore compromised by those who owe a living to the most aggressive tax avoiders. Adding to this system bias are recent reports from former top ATO people that the Tax Office now prefers to pursue negotiations rather than litigation. Few would argue that it has been weak when it comes to enforcing Part IV of the Tax Act, which requires that the "dominant purpose" of a transaction should be commercial rather than tax-driven. The point being that the government, Treasury and the ATO should man up, stop being diddled by sham structures and drag a few offenders off to the Federal Court rather than chatting with them. Same deal for ASIC. Were the corporate regulator to insist from tomorrow that all large companies henceforth issue general purpose financial statements (and disclose the purpose of all subsidiaries in all jurisdictions and all related-party transactions) – no ifs or buts – the incidence of tax avoidance would decline dramatically. The courage and the political will are not there yet. Public concern is on the rise, though. The result of concerted action is evident in the case of Macquarie, whose tricky tax structures once had it paying less than 10 per cent (the corporate tax rate is 30 per cent). Recently it has been paying 40 per cent, bringing in extra tax revenue of hundreds of millions of dollars – all thanks to the ATO manning up and having a crack. Tony Windsor recently wrote an article "No guts, no glory on clean energy" about the Abbott Government leading Australia backwards on clean energy. Further to the statement, "In 2011, Tony Windsor spent some time in Spain with Ross Garnaut, visiting a solar thermal electricity plant that uses molten salts to store heat so that power generation can take place at night or on bleak days", a modified version of this Spanish solar thermal electricity plant with energy storage is more economic. The design may not be to everyone's liking but it serves an essential purpose. At present the coal industry is desperate to maintain market share against inroads by renewable energy, natural gas and nuclear energy. The coal industry is deliberately increasing production of coal to drive down the price. This helps to keep competitors out of the energy market. The coal industry also has the capacity to pay financial inducements to "buy" government decisions to build new coal-fired power stations. It can afford to lose money on this strategy for a number of years. This is because every new coal-fired power plant will operate for at least 40 years. 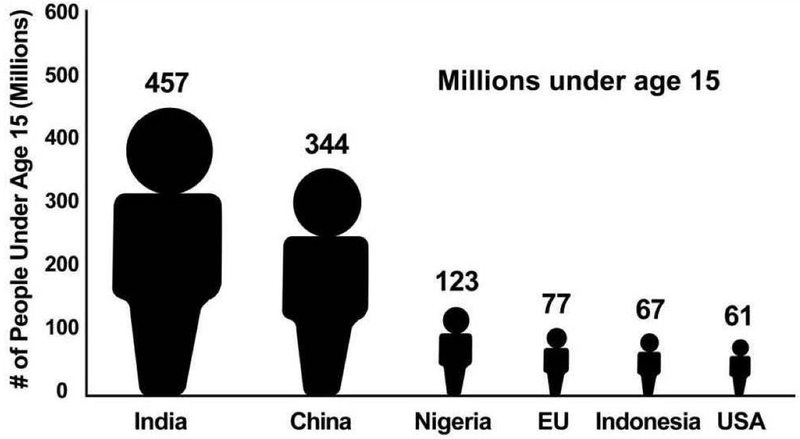 In the past decade a whopping 734 gigawatts of NEW coal-fired generating capacity has been built world-wide. It is essential to provide a financially superior large-scale power plant design to place in front of every decision-maker before they commit to constructing any more coal power plants. This may not be "ideal" but it is pragmatic. A solar thermal plant (and coal power plants) only operate at about 30 percent thermal efficiency. Solar thermal energy is available on average for about 6 hours a day. To use solar thermal energy for 24 hours a day, the area of heliostats must be 4 times greater than what is needed for operation for 6 hours. The additional heliostats are needed to add thermal energy to a molten salt heat bank. If the efficiency of the power plant is doubled to 60 percent then the area of heliostats may be halved. The way to do this is to use the solar thermal energy to convert coal and waste biomass to gas, then use the gas to generate power in a combined-cycle gas turbine power station. These can achieve 60 percent efficiency. The amount of coal used in this process is three-eighths of what a coal power would use: solar energy provides all the energy needed for 6 hours out of every 24. The efficiency is double what a coal power plant could achieve, so only half as much coal is used in the remaining 18 hours of each days' electricity generation. 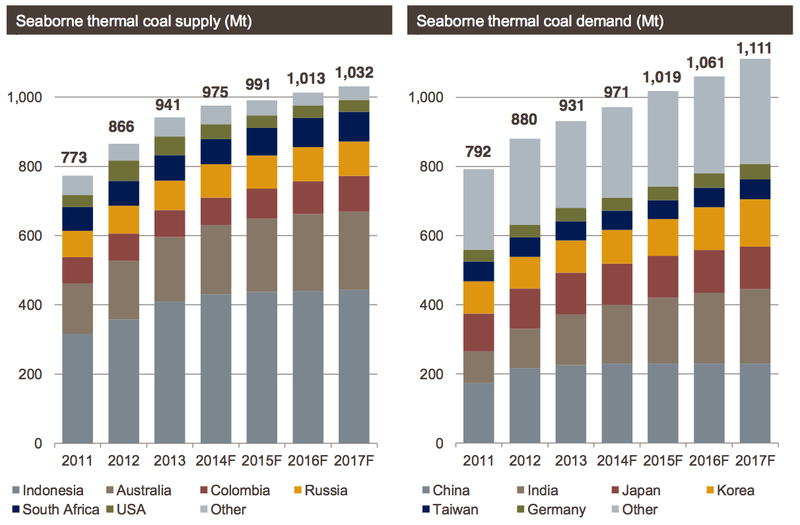 Demand for Australia's high-quality coal will remain strong for decades into the future as global energy needs continue to rise toward 2050, according to Glencore Coal's Mick Buffier. 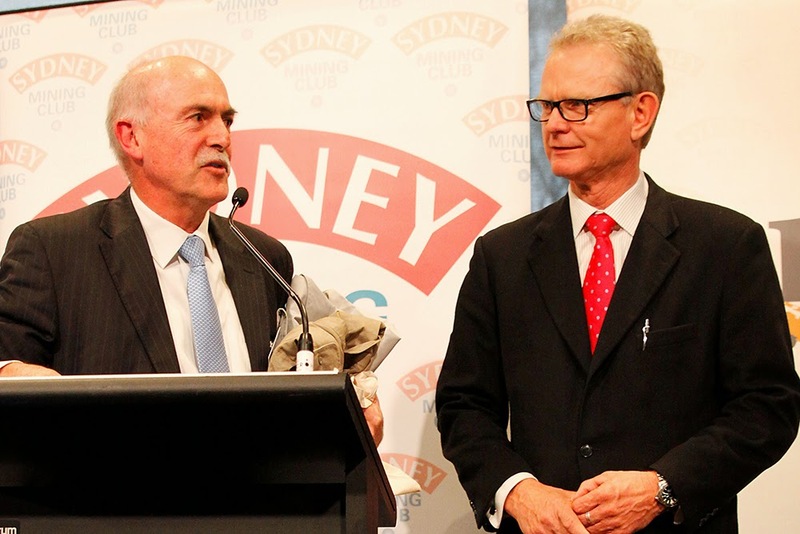 Addressing the Sydney Mining Club, Mr Buffier acknowledged that Australian mining, in particular the coal sector, is facing significant economic challenges and he estimated that around one third of Australia's coal mines are currently operating at a loss. He said there are a number of reasons why costs have risen. "The first one is the high Australian dollar, which is not helping. You can say that during that boom period we did lose control of our costs. Mr Buffier cited data from the Minerals Council of Australia showed that between 2006 and 2011, the cost of an installed tonne of new mine capacity rose from about $US70 to about $US170 a tonne. "The rest of the world was sitting at about $US120. That's part of the explanation." But he debunked some of the myths about coal and its future as a source of energy, siting independent analysis showing that prices would again rise despite current economic challenges. The world's population is forecast to rise from 7 billion to 9 billion by 2050 and he said global energy demand would continue to drive growth from all sources, including coal, for many years. "Both supply and demand are continuing to rise. Ultimately that oversupply will be caught up. Will it occur at the end of next year? Probably not, but eventually it will come back. Over time, with less investment, that will correct. You only have to go back through the past 30 or 40 years and this has happened many times." Mr Buffier cited the quickening urbanisation in Asia, in particular in India and China, as well as the hundreds of millions of people in the developing world that will still be without access to electricity in 2030, as to why coal and carbon capture and storage will be part of the answer to the world's growing energy needs. Glencore Coal is the world’s largest exporter of seaborne thermal coal used to generate electricity and one of the largest producers of coal used to make steel and other industrial applications. With thermal coal prices falling to five year lows and the price of natural gas soaring to unprecedented highs, coal-mining CEOs selling coal at or near the cost of production are failing their shareholders. 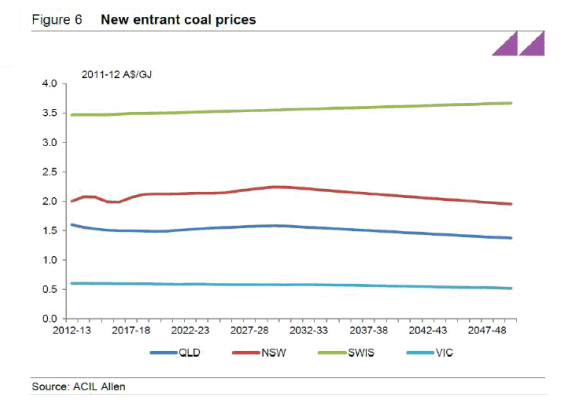 According to ACIL Allen Consulting coal in New South Wales is currently valued at around $2 per gigajoule. This low price cuts the dividends shareholders can expect to receive. It also reduces the valuation of coal reserves on the which the price of their shares depends. It can only be a matter of time before shareholders' complain of inaction by coal mining directors to substantially increase the value of coal and coal reserves. Shareholders have a right to know why coal mining directors are selling coal for just $2 per gigajoule instead of converting it to natural gas that can be sold at $9 per gigajoule. Australian thermal #coal sold in 2015-16 for just $2.69 per GJ. - POSCO, South Korea's top steelmaker, said April 3 it has set up a subsidiary to operate a synthetic natural gas business to trim its LNG consumption. The subsidiary, POSCO Green Gas Technology, was established in POSCO's Gwangyang complex on the country's southern coast, where it is building a synthetic natural gas plant with a capacity of 500,000 metric tons per year. The plant will produce SNG by processing low-cost coal. It will be completed by August and start up in January 2015. "In the interest of our shareholders and customers AGL will not proceed with the Gloucester Gas Project and will cease production at the Camden Gas Project." This is the video shown to tour guests at the Great Plains Synfuels Plant. Leaders of Australia's biggest businesses have blasted the nation's Senate as obstructive and demanded reform to restore order to government. What leaders of Australia's biggest businesses have blasted is democracy working properly. Its review body is putting the brakes on outlandish and unreasonable decisions by the Abbott Government. coal mining executives insist on the correctness of their absurd decisions to export increasing volumes of coal at steadily falling prices. 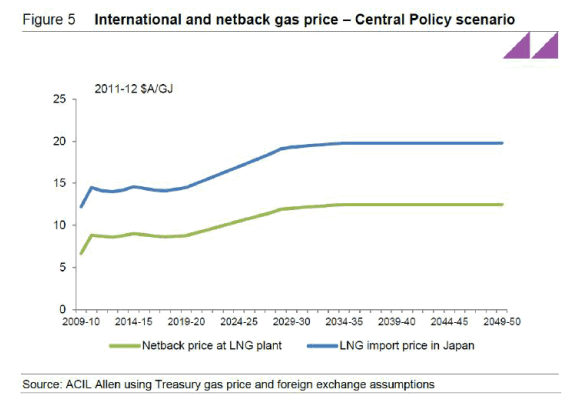 Both decisions lack the common sense shown by South Korean business leaders who have done the sums and realised it is in their shareholders' interests to buy cheap coal from Australia and manufacture their own natural gas from it.